Hello! It's a pleasure to have an opportunity to interview you regarding your amazing looking Wii U eShop title Star Ghost! [SHS]: Thank you. I appreciate the opportunity to talk about it. Could you tell us a bit about your studio? [SHS]: Certainly. 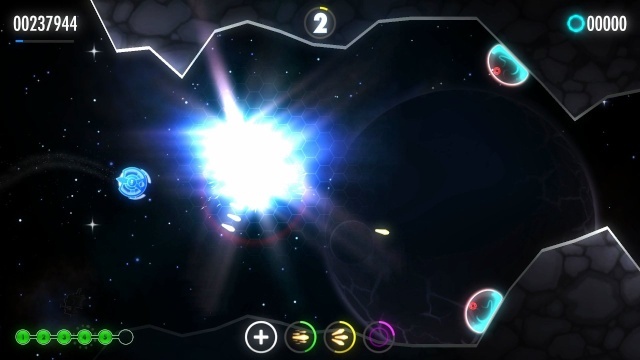 Squarehead Studios is a small independent game developer, based in the UK. It's very small in fact, being just myself at the moment. My background prior to this was as a developer with Retro Studios and much earlier, in the N64 days, at Rare. I'm currently burning through my life savings in a desperate bid to see if any of the Nintendo magic has rubbed off on me over the years. How long did it take to develop Star Ghost for the Wii U? [SHS]: It's taken about 2 years to develop. As I mentioned, I've been working on it alone, so they have been 2 very, very long years! What were your biggest inspirations for the game? [SHS]: I was fortunate to grow up in the golden age of the arcades and Star Ghost draws a lot of its inspiration from those days, both in terms of its structure and in its focus on a relatively small set of mechanics that hopefully combine together in interesting ways. I wanted to create a game with a strong hook in its moment to moment gameplay. For me at least, the draw to arcade games is that they are enjoyable to pick-up and play without the need to invest a huge amount of time grinding out the next narrative beat. Specifically, I would call out games like Scramble, Asteroids, Jet-Pak, Thrust and perhaps less directly, Moon Patrol. The neon-styled look of the game draws a little from Tron and I admit that I might be stretching a bit here, but the Vectrex console was also in the back of my mind. 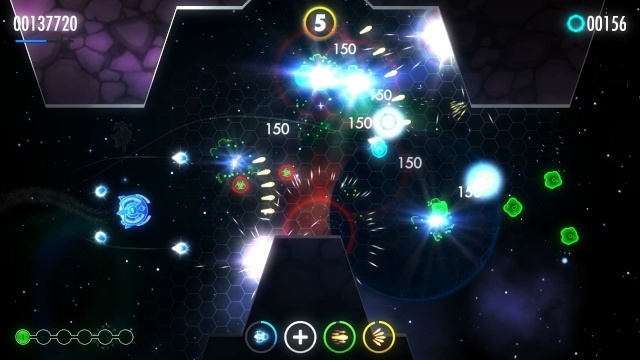 What sets Star Ghost apart from other arcade-style shoot 'em up's? [SHS]: The controls for Star Ghost were heavily inspired by the work I did on the rocket barrel for DKCR. I think they move the game into its own space and add an extra degree of challenge compared to more traditional control schemes. Secondly, each sector in the game is procedurally generated from a library of prefabs. This helps keep things feeling fresh. You can't rely on memorising patterns, so you have to stay very engaged with the game. What can fans expect in-terms of the game's level of difficulty? [SHS]: If you haven’t played a one-button, rocket-barrel style game before, there is a bit of a learning curve there. On top of that, there are extra controls on the left stick. You can direct your fire, or engage your traction field (but not both at the same time). This usually takes people several games to adapt to. At first it can seem a bit like trying to pat your head whilst rubbing your tummy, but once it clicks, it does feel like second nature. I've tried to create a smooth difficulty curve that extends quite far into the game. It’s not a bullet-hell experience at all. This might sound odd for a shmup, but I think it feels a bit more zen-like when you begin to master it. What is your favorite aspect of Star Ghost? [SHS]: Well, it’s very hard to argue with a David Wise soundtrack but I think it’s a toss-up between the asteroid stages and the procedural generation for me. The asteroid sections feel really empowering when you've got suitably upgraded weapons and things are blowing up left, right and centre. The procedural generation makes a huge difference to replay-ability and keeps the game feeling fresh. What's next, after Star Ghost releases next Thursday? [SHS]: I'm investigating options for getting the sound-track out there and of course I'll be supporting the game, post-release as best I can. Hopefully at some point, I can get a long nap, followed by a beer and a curry. Thanks! We think that was all of our questions, hopefully we'll have the opportunity to interview you again sometime! What did you think of our interview? Did you learn anything new about Star Ghost? And will you be downloading the game when it hits the Wii U eShop in North America and Europe this Thursday? As always be sure to let us know your answers to our questions in our comment section below! Re: Developer's Interview: Our Discussion With Squarehead Studios' Rhys Lewis About His Upcoming Wii U eShop Title Star Ghost! Congratulations on another very professional developer's interview, @Ichigofan! I hope you continue to receive many more opportunities to interview developers and provide exclusive content like this to WiiWareWave's wonderful audience. I know how important this interview is to the integrity of your website, so I just wanted to let you know that there is a slight typo in Rhys Lewis' second reply. You must have unknowingly misspelled "through" in the last sentence. You know what I miss most in these kind of interviews is a video trailer or walk-through, perhaps commented by the one being interviewed or the developer. A screenshot tells a thousand words, but a video tells the story. That will make stand out WiiWareWave from the rest, yk. A unique pre-recorded vid that comes with the interview, a special, a WiiWareWave-only (?) feature. @WilliamFrankLepleyIII Thanks I missed that when I was proofreading the interview. The heck? I just noticed a bug...there are two like buttons on thanked posts, well that's a peculiar one that needs to be addressed. I've never once noticed a "Thanked Post" on WiiWareWave since I first became a member in 2011. @WilliamFrankLepleyIII It's always been there, but the mechanic has been changed, thanked posts were a different colour than other posts, but there was no message associated with it. Good interview. I'm interested in picking up the game. Playing Tropical Freeze atm. Nice interview! I'm downloading Star Ghost later today.